This is a great find! 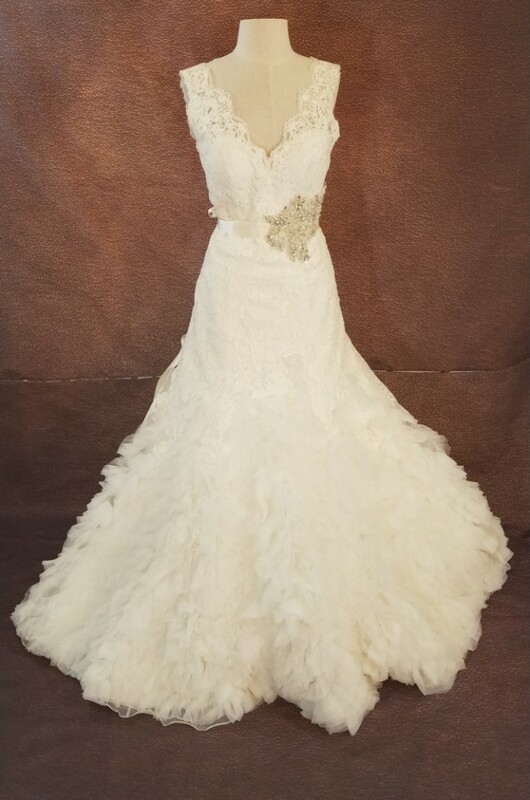 Custom Allure Bridals gown, no size listed, but measures 38"x29"x38". Length is 59" from top of shoulders to hem. In amazing, like new condition. This is a very serious dress- it look quite delicate, with the lace body and sheer lace neck area, but make no mistake- this is a serious gown! It is quite heavy, and there is a heavy interior lining with full boning, and an adjustable metal hook to close it. The bottom part of the skirt is comprised of chiffon and tulle, which is so much fun! I love this dress. It has been cleaned, is in near-perfect condition, and is ready to wow you :) I am happy to answer any questions!